In the marketing literature, the introduction of the consumer experience perspective or experiential view in the 1980s encouraged a major shift from cognitive frameworks and buying decision process towards the understanding of consumption as a “steady flow of fantasies, feelings and fun” (Holbrook and Hirschman 1982: 132). Popularized in the mid-1990s, the notions of experiential consumption and experiential marketing have since gained an important place in research. In consumer behaviour, an experience refers to a personal and emotionally charged event (Holbrook 1986), resulting from a multidimensional interaction between a subject and an object within a given situation. An experience is meaningful from the subject’s perspective and can occur in commercial and non-merchant environments. In marketing, the term designates an offer orchestrated by a brand, a company or an organization to engage individuals in a memorable way and deliver superior value (Pine and Gilmore 1999). 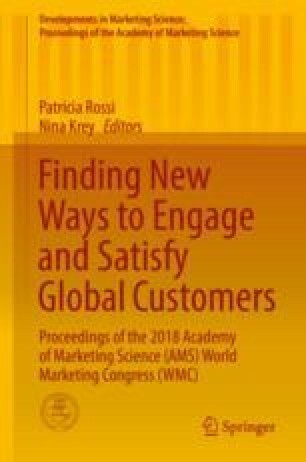 Over the past 30 years, the experiential aspects of consumption and managerial approaches, known as marketing experiences and experiential marketing, have been widely investigated by both academic and professional circles (Lanier and Rader 2015; Lemon and Verhoef 2016). Digitalization and social media have drastically enriched and transformed the experiencescape, yet more than ever the customer experience remains a relevant and fruitful concept to understand what subjects live in physical and virtual contexts (Carlson et al. 2017). This special session on experience presents four contributions whose common goal is to provide a deeper understanding of the customer experience in very different contexts.